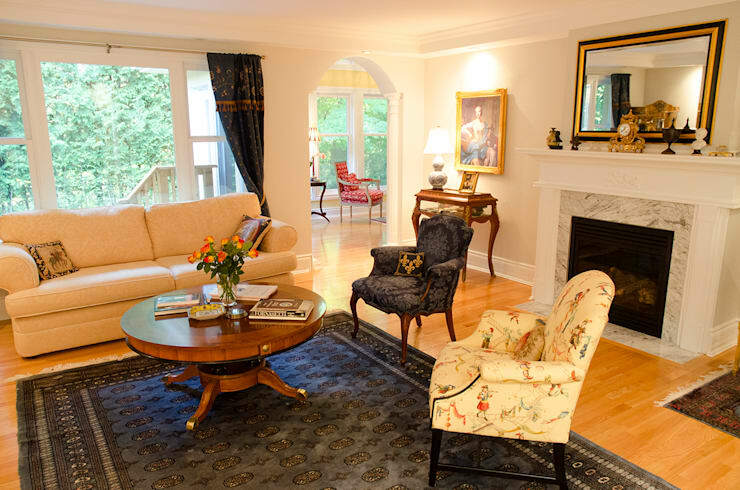 A reno project that exudes class and sophistication! When you see how utterly stunning these home renos are, you'll want to know a lot about the incredible architect that oversaw the project, which is why we thought it would be a great idea to tell you a bit about them! In operation since 1991, Jane Thompson Architects have completed a range of fabulous residential, commercial and intriguing projects, including a meditation centre. The philosophy of the firm states that each project should reflect the aspirations, program requirements and means of its client, should enhance its surrounding built and natural environment, and should explore enduring architectural qualities of form, proportion, space, colour, light and material and we think you'll agree that this home absolutely does that! 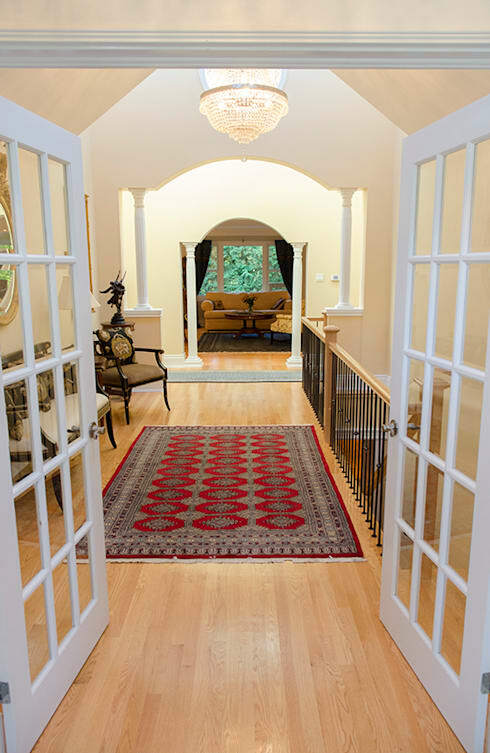 Come and take a look at two beautiful home, accented with traditional elements and fabulous colour and if nothing else, be sure to enjoy the beautifully embellished hallway! 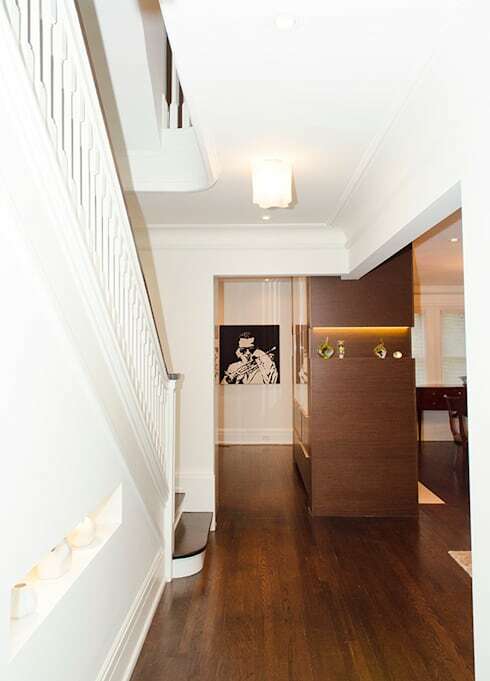 Don't you love the way that bright white walls meet shiny dark wood here? The dramatic contrast is just so perfect for creating a luxury vibe! What a way to add some dramatic color into this home! 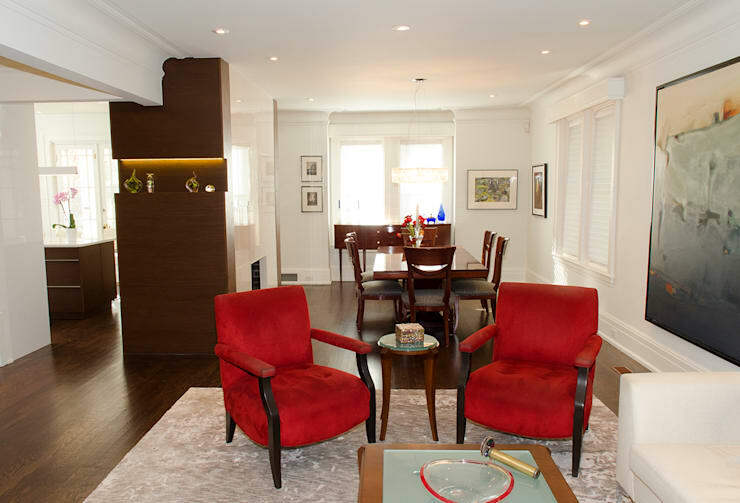 A pair of matching red velvet chairs are the perfect focal point and radiate so much warmth out into the wider room. A touch of rustic chic. 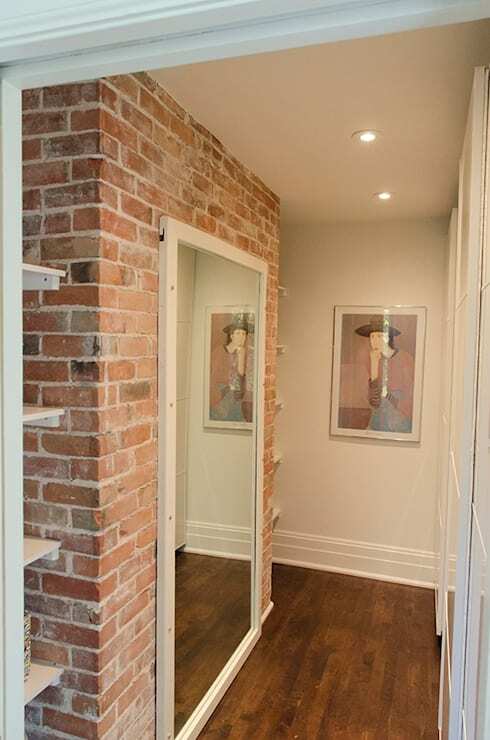 An exposed brick wall is such a beautiful way to nod to the heritage and originality of this property. With just a mirror as decoration, there is a suitably understated look and a sunny aesthetic that we love. 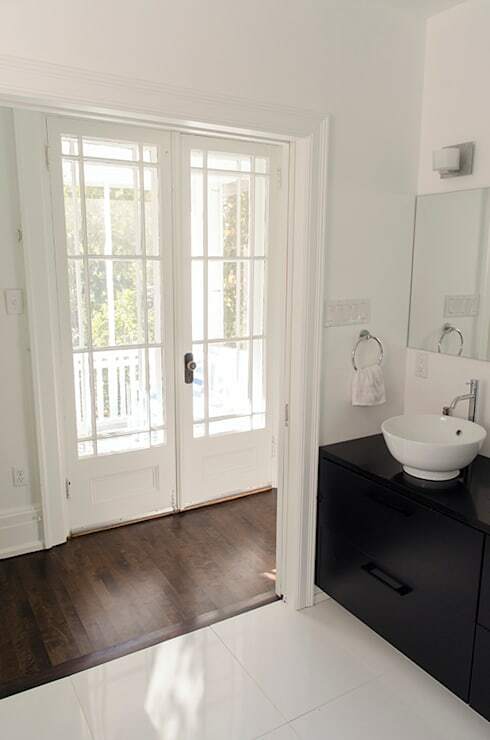 Seriously, how can even the bathroom here look so quintessentially modern and gorgeous? It might be simply decorated, with a monochrome scheme, but it offers such a bold and yet usable aesthetic. Wow! 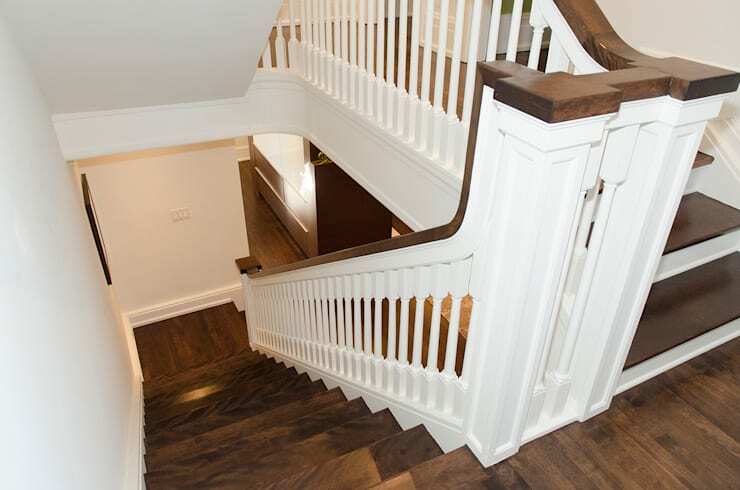 the mix of heritage balustrades with a more contemporary bannister here looks phenomenal! Add in the bold contrast of finishes and you have something genuinely eye-catching and special, not just useful! House 2: A hallway to die for. Technically, this is a landing, but we've never seen one quite so large or so grand! The inclusion of a vintage Persian rug was so inspired, as it has lead to a vibrant burst of color, extra comfort and a great basis for other antique pieces to be included! We dare you to try and tell us that this living room isn't chock full of luxury touches and fantastic antiques. There is such an inherent level of comfort as well though! It's amazing how well curated this room is, as so many eras and styles are working perfectly together! For more dreamy home reno inspiration, take a look at this Ideabook: From garage to home: A remarkable reno. Would you take on a reno if it could look this good?